Hunter Pence is #ForeverGiant. He is a Great Giant and nothing anyone says will ever change that. His legacy was sealed in 2012 when he single-handedly rallyed the troops in 2012 against the Reds in Cincinnati. 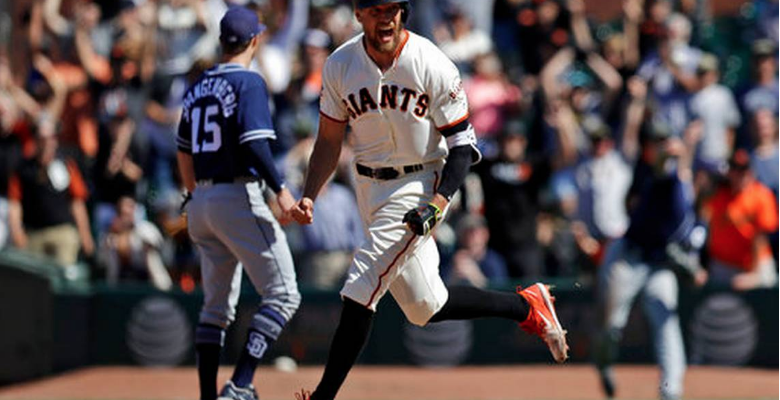 Today, in a thrilling pitcher’s duel of a ballgame that say Dereck Rodriguez pitch 7 innings of one-run baseball and a game in which the Giants rallied to win after falling behind 2-1 in the top of the 11th, Hunter Pence AKA “The Reverend” was the hero. His bases loaded 2-run double on an 0-2 count down the right field line created quite a celebration and pushed the Giants above .500 to 40-39, a scintillating accomplishment after a dreary week in Miami and Los Angeles. Home cooking is where the Giants thrive. These may be the last days of Hunter Pence and if so, we are witnessing the twilight of a great ballplayer and an even greater teammate who gives his all every game and to every teammate. Forget Sunday’s heroics. Hunter Pence deserves our respect and gratitude no matter what, just for being the Reverend.